Let’s see. First thing I did was scan an image from an old book, from a 1915 Italian magazine cover, that I’ve always liked a lot. I cleaned it up digitally, sorted out the bits that needed to touch, and cut these three guys as stencils. Love ’em. 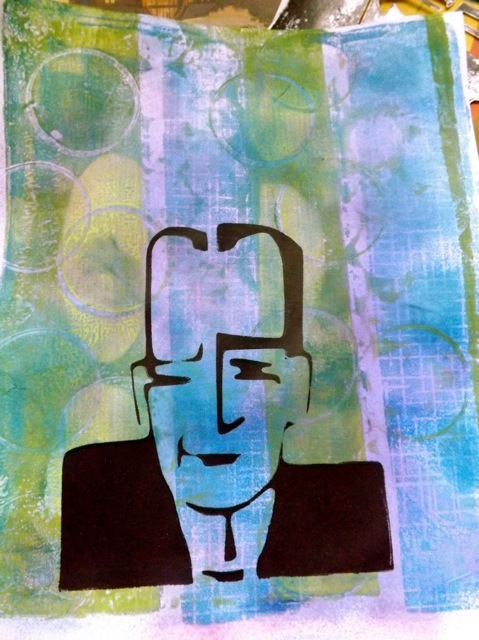 Then I went back to a Gelli print that I’ve had hanging about and added to it. I was curious to see if it would look OK to have a page in my crumpled paper bag journal that had a print stuck to it, rather than having the page built on the paper bags. I started with this guy, who looks slightly smarmy to my eye. That fits the subject. I just inked the plate with black and pulled the print over the old one. Now, the purple colour you see is from something I knew I had but just had to locate. 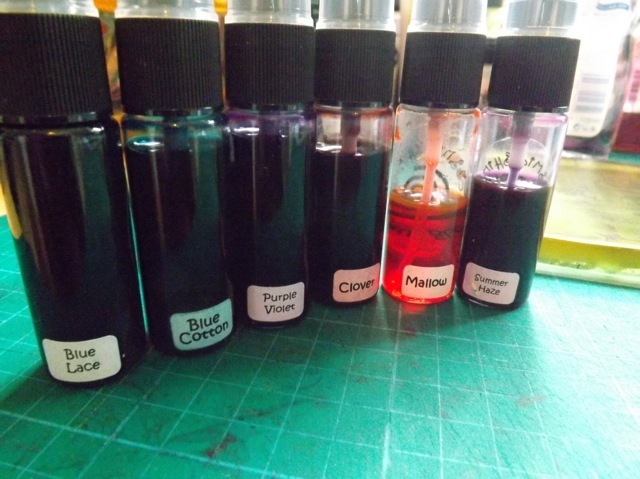 I was sure I had some form of waterproof, non-smearing sprays someplace but I needed to think where I might have stashed them, as they were NOT with the other sprays. Found ’em hiding with the Distress Stains – what was my thought process for that? Probably just that’s where they fit at the time. 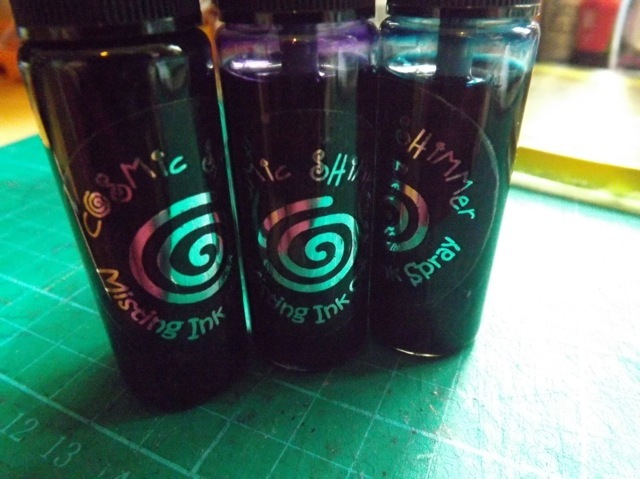 Tricky to get a decent shot of the metallic labels but they are called Cosmic Shimmer Misting Ink Spray. I got them a couple of years back as a freebie gift from Craft Stamper. 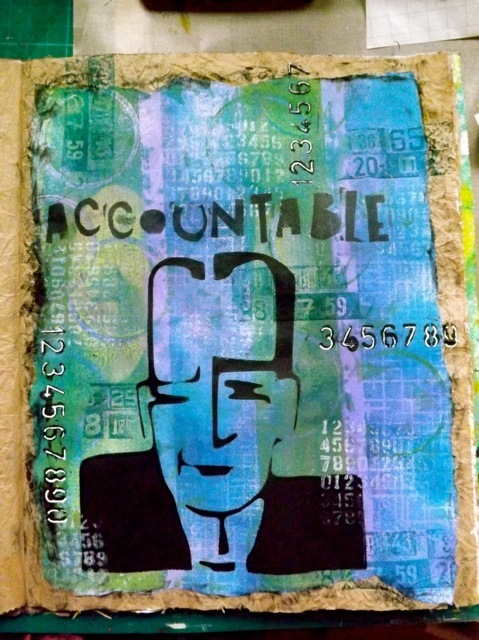 They worked great over the Gelli print! It was interesting to see how they at first seemed to sit on the surface of the paper, but before my eyes just seemed to sink in to all the empty areas. They may be branded Cosmic Shimmer but they don’t really have a “shimmer” to them at all. It took me ages to find someplace that sold them still and I am sure I’ve duplicated some of the colours, but they are fab. I must have used them once, as Mallow is pretty depleated. 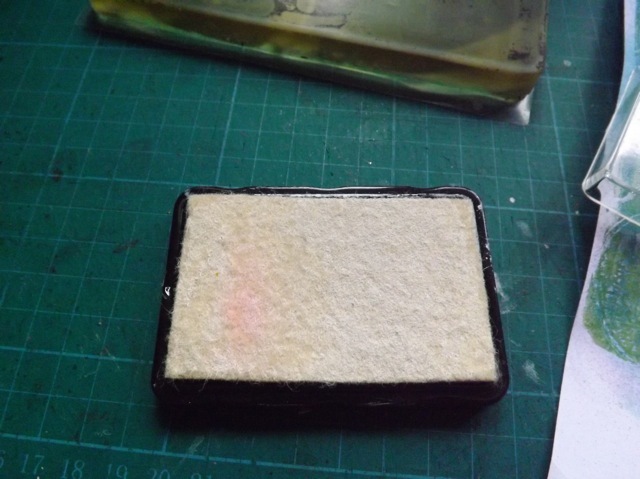 Then I went back to the stamp pad I made a week back – still wet, still stamps perfectly fine with the white acrylic ink still making a good mark. That smear of pink isn’t the issue I thought it might be. Yay! And then I stamped with the fun foam letters from yesterday. A tiny bit of over-stamping but like I said,m with a grungy font it matters less to me. And then I stuck it in and I think it’s OK.
LOADS of room to add my journaling around the edges and I am pretty happy with it. Categories: art journal, Gelli plate monoprints | Tags: art journal, Gelli, Gelli plate | Permalink.